A Christian program called New City Kids uses tutoring, music, leadership training and spiritual formation to help children in three cities transform their lives. It has been remarkably successful: 100 percent of its graduating seniors have gone to college. On a recent Wednesday afternoon at the intersection of Jersey City’s Monticello and Fairmount Avenues, the steady drumming of jackhammers overwhelmed the sounds of the street, while drumming of a far more jubilant nature erupted inside the former warehouse on the corner. Ahmad Abdelaziz, 18, was just beginning the advanced percussion class he teaches at New City Kids, the faith-based after-school program that serves the low-income population of this city just across the Hudson River from New York City. 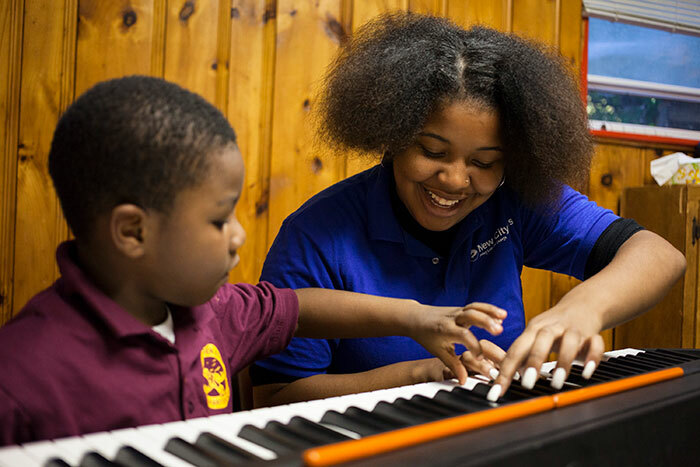 Opening its doors every weekday to local children in grades one through eight, New City Kids brings tutoring, music lessons and spiritual development together in a model that aims to empower urban youth to break the cycle of generational poverty. The program has blossomed over the past 13 years, with an annual growth rate of 10 to 30 percent. Slight and buoyant, with a smile that fills the room, Abdelaziz asked his students -- all fourth-graders -- to play a beat, nodding in encouragement as they each took their turns. Ahmad Abdelaziz -- former New City Kids student and now a teen intern -- teaches fourth-graders how to play a beat. Not long ago, Abdelaziz was in their shoes. Before he became a paid teen intern at New City Kids as a freshman in high school, he attended the after-school program for six years, starting as a third-grader. In those early years, the drums were not just a form of creative expression for Abdelaziz. They were a lifeline. Born in Egypt in a Coptic Christian family, he spoke very little English when he first started at New City Kids. He had a hard time communicating in his new home -- until he found the drums. The organization’s co-founder, Trevor Rubingh, identifies nine elements of the New City Kids after-school model that contribute to its effectiveness. Now he imparts what he learned, in the sustainable cycle that is ingrained in New City Kids’ DNA. Here, it’s not just about drum teachers but about generations of drum teachers. Ron taught Anthony, who taught Giovanni, who taught Greg, who taught Derrik, who taught Giselle and Ahmad. If it sounds like a family tree, it is. “You spend so much time with this group of kids, they are like family,” said Gabriel Stiritz, the operations director at New City Kids. The students gather from 3 p.m. to 6 p.m., Monday through Friday, throughout the school year -- and that kind of time builds relationships, which is one of the pillars of their model. And for Teen Life Interns such as Abdelaziz, the time commitment is even greater. In addition to running the after-school program for the elementary and middle school kids, the interns all commit to attending college prep sessions. New City Kids is proud of its record: since 2009, 100 percent of its graduating seniors have gone on to college. The demographic New City Kids aims to serve is what its leaders call the “middle 60.” The philosophy is that the kids on both ends of the spectrum -- those who have already experienced the juvenile justice system and other risk factors, and those who have strong church and family ties -- are supported by other programs or networks. Who are the “middle 60” in your work? How can you serve them in new ways? Children get help with their homework every day at New City Kids. Standing in the back of the biggest room in the building -- the sanctuary -- Stiritz explained how a typical afternoon begins. The kids arrive after school, have a snack and then participate in the 20-minute “community time” session. This is the Christian formation part of the program. On a recent Wednesday afternoon, an 8-year-old girl in a bright pink sweater sat on the stage, answering questions about her faith journey with the help of her teenage translator. Rows of chairs below the stage were filled with attentive children and teens. “When I was 4, I saw a building, and I saw a man on a cross,” said the girl, Adasha, speaking in Spanish. “I felt so bad for him. I asked my mother to buy me a book about it.” That is how she first learned about Jesus. “Part of our goal is to share the gospel,” Stiritz said. “But if they say, ‘That is not for me,’ they can [still] go through the program.” A few of the children who attend the Jersey City site are from Muslim families, and their parents have opted them out of community time. They sit at a table in the sanctuary during that time and do their homework. At 4 p.m. on the dot, the children move to the next block of time -- either one hour of homework help or one hour in music lessons. They switch again at 5 p.m. for the last hour, moving from music to homework or vice versa. The timing is precise. As soon as community time ends, a giant countdown clock appears on the screen, right down to the tenth of a second. A high school student teaches first-graders how to play piano. Music is a critical pillar of the New City Kids model -- one of the nine ingredients of their “secret sauce,” as co-founder Trevor Rubingh likes to call it. “At the end of a six-hour school day, kids come in tired. Music re-energizes everything,” Rubingh said. Kids choose bass guitar, keyboard, drums or vocals -- all of which are taught by the Teen Life Interns. The interns are known as blue and black shirts, with the more senior wearing the blue shirts. New City Kids brings in a teacher to offer a master class for the teen instructors so they can work on their own skills and get help developing a teaching curriculum. The music is not just a creative outlet that lifts spirits. It is a path to worship, Stiritz said. The kids’ musical accomplishments are showcased twice a year during the fall and spring fundraising concerts, which they play to sold-out audiences. The teens run the show -- not just on the stage but behind the scenes, too, helping with lighting and tech design. What are other fun and interesting ways in which teens or others can learn leadership and responsibility? In fact, teens run the show during the week as well. 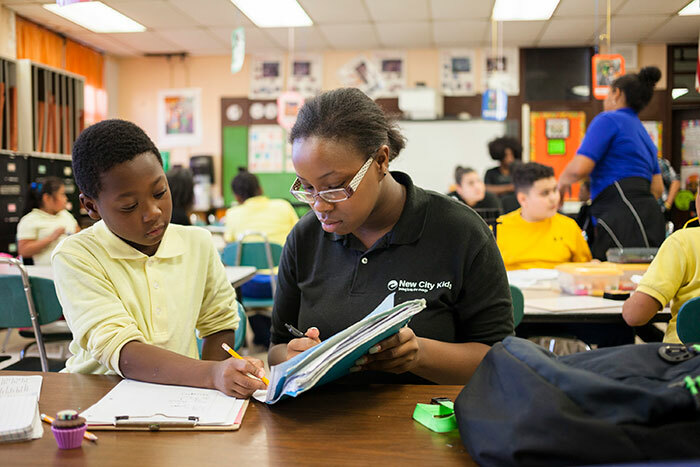 In Jersey City, 100 Teen Life Interns manage the homework help, reading tutorials and translation. Encouraged to find solutions and take responsibility, they find their own voices. 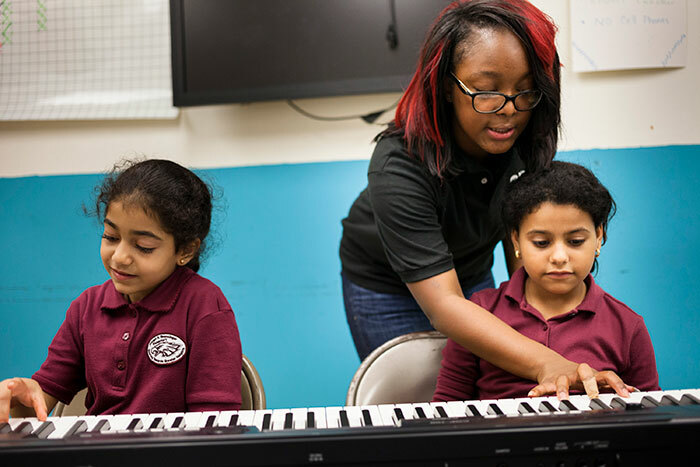 With help from a New City Kids teen intern, a child learns the names of the piano keys. In its current iteration, New City Kids has been in existence since 2005. But it started earlier as a church. Back in 1994, Rubingh and his wife, Linda -- both recent graduates of Princeton Theological Seminary -- were inspired to start a kids church in an under-resourced area. Rubingh knew that planting a church in a less traditional setting would also give him and his wife more flexibility and room to be creative, he said. While Linda Rubingh spent some time serving in a Presbyterian church in the suburbs of New Jersey, that never appealed to Trevor. Jersey City popped onto their radar. An ethnically diverse community that is home to 17,000 people per square mile, Jersey City has a high percentage of low-income families. More than 19 percent of the population lives below the poverty line. The Rubinghs found space in a Baptist church and started bussing in 200 to 300 children every Saturday for worship. “It was like Nickelodeon on steroids,” Rubingh said, reminiscing about the high-energy, rock-band outreach. Back then, music was the pathway to engaging teens. The Rubinghs had been looking for adults to volunteer -- serving as bus captains, assisting in worship, etc. -- but could not find people willing or able to give the time. Those who did have the time were the teens who were hanging around. One day, Trevor walked up to one of them and offered him a drum lesson. That was how the teenage engagement began -- and stuck. 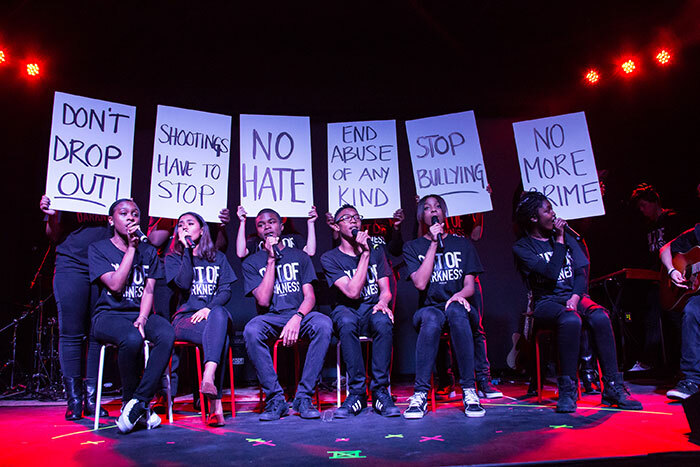 Teens sing at New City Kids' benefit concert. “God used the lack of viable adults to show us the true calling -- teenagers,” Rubingh said. What points you to the “true calling” in your work? With time, the Rubinghs witnessed a religious awakening among members of their congregation. But they were frustrated that the kids’ lives weren’t changing. They weren’t getting good grades. They weren’t going to college. So around 2000, New City Kids Church started to retool. They asked themselves: What if we didn’t reach 300 kids, but 30? What if we spent more time with them, getting them to college and giving them job skills? They spent the next few years developing the after-school model, and in 2005 New City Kids relaunched in an abandoned warehouse as an after-school program. That first year they started with 17 kids. Is your organization accomplishing its biggest goals? If not, what changes could address that? By 2007, New City Kids was really starting to hum. The program had 40 Teen Life Interns, serving 70 kids. They had added college prep for all their teenagers -- incorporating SAT classes, guidance with applications and financial aid forms, and college tours. “A lot of our interns expect they will go to college, but unless they have an adult walking them through the process, it would be a very difficult goal,” said Karen Dilsizian, the college and alumni relations coordinator at New City Kids. She and other staff members guide the teens through the application process, and offer support to program alumni who are away at college. With all the elements of the after-school and college prep programs in place, it was time to think about expanding. In 2011, New City Kids opened new locations in New Jersey. Today, the nonprofit serves 450 kids across five locations: three in Jersey City, one in Paterson, New Jersey, and one in Grand Rapids, Michigan -- where Trevor and Linda are now based. After 20 years in Jersey City, Trevor felt the need to be closer to his aging parents in Michigan. They brought the New City Kids model with them. One of the secrets to New City Kids’ success is the organization’s smart goals. They measure impact across the four sectors of their mission: academics, music, leadership and spiritual development. “We are very outcome oriented. We track 1,000 data points,” Stiritz said. They track everything from the rise in reading levels and SAT scores to the number of days youth are served during the year (313 for 2016-17), the number of hours dedicated by staff to one-on-one teen mentoring (736), and the number of performances during the year by teen and kid bands (53). 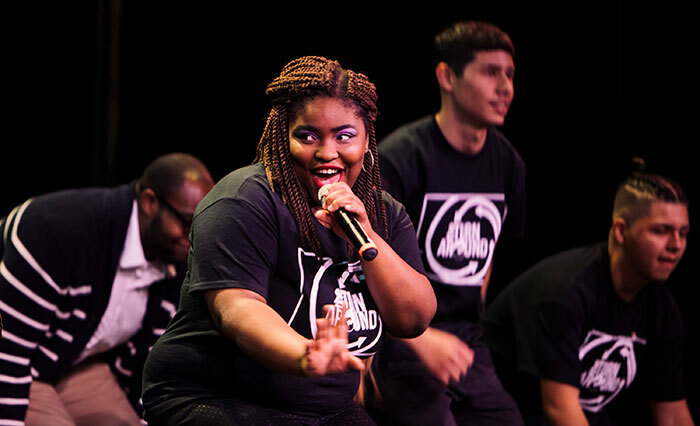 The New City Kids' annual benefit concert draws a crowd of more than 1,000 and raises funds for the Teen Life Internship program. This close measurement makes them an attractive partner, he said. New City Kids, which is registered as a 501(c)(3) public charity, receives almost half its financial support from individual donations. With an annual budget of $1.9 million across the five locations, New City Kids receives funding from foundations and church support (16 percent and 17 percent, respectively), government grants (7 percent), and corporate grants (2 percent). Another secret is self-reflection -- always looking for ways to improve. But while New City Kids is agile enough to adapt -- having taken a vastly different turn from its original kids church -- its leaders are also meticulous about documenting the lessons they’ve learned along the way. They have developed a training program they call “New City Kids University” for new staff being onboarded to launch and scale the model in other locations across the country. How does your organization engage in the practices of measurement, documentation, reflection and adjustment? There is no denying the need for after-school programs. According to the national nonprofit Afterschool Alliance, 20 percent of kids nationwide are left alone and unsupervised between 3 p.m. and 6 p.m. -- prime time for kids to engage in risky behavior. In all three of New City Kids’ Jersey City locations, there is a waiting list of 10 to 15 kids every year. Just as the capacity for the program grows, so does the demand. The organization is a trusted name in the community, and they keep costs down for families. Parents pay only $80 per year for the first child and $40 for each additional child enrolled in the program. On the recent Wednesday, Abdelaziz, distinguished as a teen leader by his blue shirt, said he is not worried about leaving New City Kids in good hands when he goes off to Montclair State University in the fall. “These guys are fast learners,” he said, referring to the teens in black shirts. Gesturing to the sanctuary, where children were getting started on their homework, he said, “I see a reflection of myself in these kids.” By the time he finishes college, some of the grade schoolers he teaches may be running the program, wearing their own their blue and black shirts. Even if your organization doesn't work with children, how can it use this model of generations teaching each other? For Stiritz, saying goodbye to the graduates is an annual occurrence. He joined New City Kids shortly after Abdelaziz was enrolled as a third-grader. Is it hard to say goodbye to the seniors every year -- this group of kids who have become like family? What is the equivalent of the “middle 60” in your work? Could you serve that population in new ways? Are there fun and interesting ways to encourage teens or others to learn leadership and responsibility? Is your organization accomplishing its biggest goals? If not, how could you change your model to address that? Trevor Rubingh said that the lack of adult volunteers paved the way to “the true calling -- teenagers.” In what ways could you discern the “true calling” in your work? Measurement, documentation, reflection and adjustment are hallmarks of the New City Kids model. Is your organization engaging in these practices? New City Kids is based on generations of kids teaching each other. Could you use this model, even if you don’t work with children?